Life’s not fair, guess what? Neither is business! Published on October 22, 2008 in Recession-Proofing and Strategy. 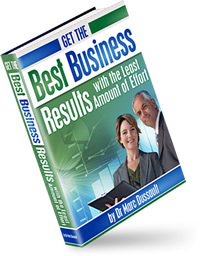 1 Comment Tags: business, Business Development, Growth, Increase Sales, Marc Dussault, More Profits, More Sales, Recession, Recession-proof, Win In Business. Today’s post is about what separates Champions from Challengers, Challengers from Competitors, Competitors from Participants and finally Participants from Spectators. I am currently competing at the World Master’s Squash Championships in Christchurch, New Zealand and chronicling my exploits on my Personal Mastery Blog. Yesterday’s post discussed the ‘Kryptonite’ phenomenon in sufficient detail that I won’t repeat it here, but there is one additional distinction that I didn’t quite articulate sufficiently that has more to do with business than squash so I will post it here. You have to be MUCH better to beat a lesser competitor when that competitor is a ‘scrappy’ hacker style player. Let me be crystal clear with the squash analogy first – if an unorthodox player wins, he wins. In business it’s exactly the same – the ‘scrappy’ competitor may win a client today, tomorrow and the next day after that, but if you stay the course and improve, you WILL get to the point where you can dictate terms and conditions and set the rules for you to win. In academic circles, it’s called the ‘terminal degree’ – no, not the degree that kills you (even though it might feel that way! ), but the LAST DEGREE you end up with. There is a similar, but quite different concept in corporate development called the Peter Principle which is not quite where I’m headed with today’s distinction. THE GOOD NEWS: Every competitor has a point where his/her ‘scrappy’ skills won’t take them any further. Most people don’t realise this is the case, but if YOU DO, you can use that and leverage it to YOUR ADVANTAGE. THE BAD NEWS: You have to be a LOT better to overcome the ‘scrappiness’. You can’t just be a little better, you have to be a LOT better. Case in point – I played a match today that I lost BECAUSE I couldn’t put enough pressure to PROHIBIT my opponent from using his unorthodox shots. I was the BETTER PLAYER TECHNICALLY – but he had a weapon that I couldn’t neutralise. I wasn’t better enough. Even though that is poor grammar, I’m sure you understand. With your sales, marketing and product/service delivery, you have to be MUCH BETTER to become the DOMINANT PLAYER in your ‘space’ – whatever that may be. A recession is the ‘scrappiest’ business cycle there is. Everyone is scrambling to make ends meet, desperation and fear take over pretty quickly. If you want to know my thoughts on what to do in a recession or what to do to recession-proof your business, click on the hyperlinks. I produced a $17 video that explains it 42 minutes. Your competitors won’t know what hit them if you do what I suggest in the video!